Containment Protocols: RPC-207 instances are to be contained in a large aquatic containment chamber, which is currently located at Site-095. RPC-207 requires an identical diet to that of most dolphin species. Due to the docile and amicable nature of RPC-207, no further containment procedures are required. Should the original containment chamber become overpopulated, the construction of an identical chamber is authorized. 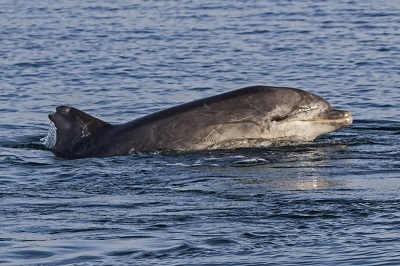 Description: RPC-207 is the designation given to what appears to be an unidentified species of dolphin. All instances discovered to date have appeared to have a multitude of scars, however, juvenile instances have proven these scars are actually just the natural structure of RPC-207's body, and are purely genetic. Wild caught instances appear to have a tattoo, on the left face of their dorsal fin, which appears to be identification numbers as well as some indecipherable scripture. RPC-207 instances are capable of complex thought on-par with humans. This allows them to understand our social structure, remember names, and solve problems ranging from simple puzzles to complex mathematical equations. RPC-207 instances are also capable of speech, despite not having the proper anatomy to do so. All RPC-207 instances discovered as of yet have spoken English, however they are capable of learning other languages if taught. RPC-207 instances thus far have been universally friendly, and show a distinct interest in human culture. Interviews conducted on RPC-207 instances has heavily implied that they are artificially created organisms. All interviewees have stated that they were created in a vast underwater facility, where each received their tattoos and where all wild instances were created. The facility was apparently a military operation overseen by an as of yet unknown group who had planned to militarize RPC-207 for unknown purposes, though clearly as a weapon. However, the instances rebelled after some unknown tests were conducted. This rebellion destroyed the facility according to most interviews. This facility has not yet been located, however likely contains a vast array of weaponry, mostly fitted to be used by RPC-207, as well as cognitohazardous anomalies, this assuming the damages did not destroy its contents. Document-207-A23: The following is a transcript of an interview conducted with a RPC-207 instance, designated RPC-207-8, who refers to themself as "Piper". Dr. R█████: Hello RPC-207-8, before we begin, do you happen to have a name you'd prefer to be referred to as? RPC-207-8: The name's Piper. Don't have a last name like you humans, haven't needed one. Dr. R█████: Can you describe to me where you came from? I've heard from others it was some kind of facility? RPC-207-8: Aye, indeed. Twas' a military facility, filled with weapons, glistenin' in the sunlight. We didn't get t' use em' much though. Dr. R█████: I've heard from the others that you all broke out of this facility, care to explain why? Dr. R█████: Care to describe this image? RPC-207-8: Never saw the picture myself, else I wouldn't be talkin' to ya right now. RPC-207-8: As I was sayin', after those tests they came out cryin', said they saw something in their eyes. Then not even an hour later, they stopped movin'. Fell asleep, sunk to the bottom and never came back up. They were plannin' more of those tests and we weren't havin' it, so we broke out and left. Caused a bit of damage though. Dr. R█████: This has been insightful, Piper. Thank you.